Kean University 3D Student, Sara Fergenson, designed this creative motif from her cup pulp board coffee trays. This is one of many examples of student work to follow. Many sculptures can be created from an environmentally friendly materials. Try this project yourself and see what you can do. Maybe a graceful ballerina is waiting to evolve out of your tray also. Sara is our future Edgar Degas. Sara, it is hard to believe that you created something so awesome that once was carrying a coffee cup. Wow! You are good. Much success and keep up the great work. Lovely creative use of materials. Great way to recycle and use your imagination. 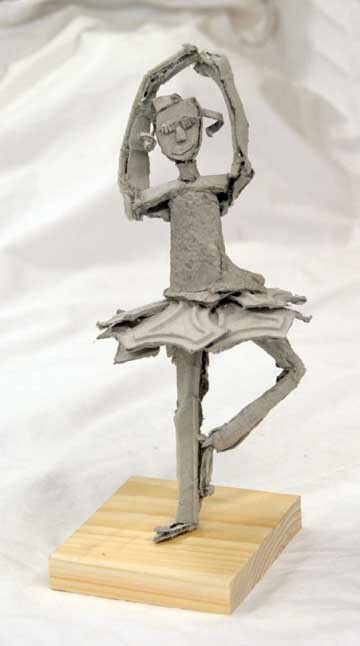 It is shear poetry to see how you balanced this graceful ballerina on her presentation stage. The attention to detail is amazing, (ear ring, eye lashes, hair) you had me checking under her arms to be sure you shaved and use deodorant as well. This is a hot piece of art work. Great job and I look forward to seeing more. Oh to be so artistic! Only a true artist can take something so plain, ordinary, and unattractive and create something that evokes awe and wonderment at such talent. Sara, This is awesome artwork! Congratuations!